Follow the latest Earthquakes news, videos, and analysis from ABC News. 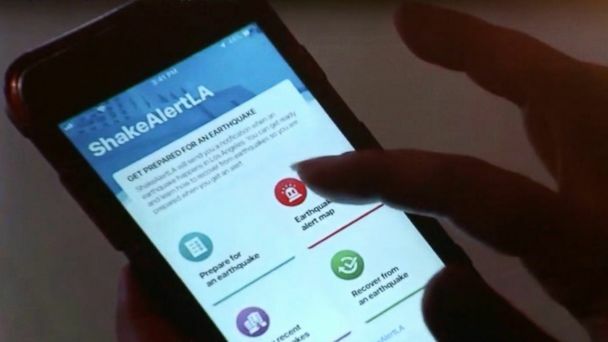 ShakeAlertLA app, developed by LA Mayor Eric Garcetti in partnership with AT&T and United States Geological Survey, was released on Dec. 31. Recovery underway after 7.0 quake causes major damage. 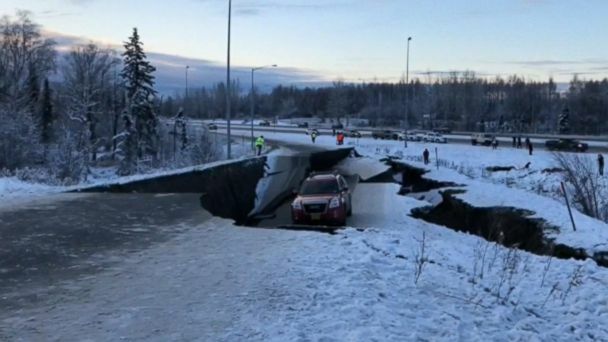 No reports of injury or death after massive earthquake hits Anchorage. 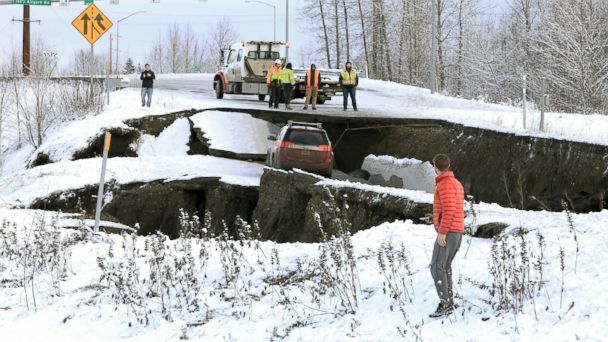 Workers continue to clean up damage from Friday's powerful 7.0 earthquake in Alaska. 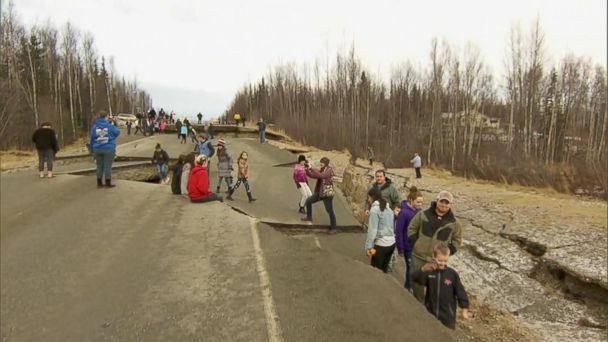 The 7.0 magnitude tremor triggered a state of emergency in Anchorage. 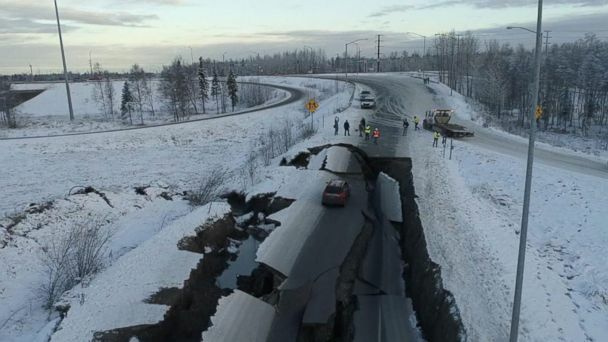 A massive 7.0 magnitude quake struck near Anchorage on Friday. The footage was captured near Anchorage International Airport. The earthquake was reported by the USGS. 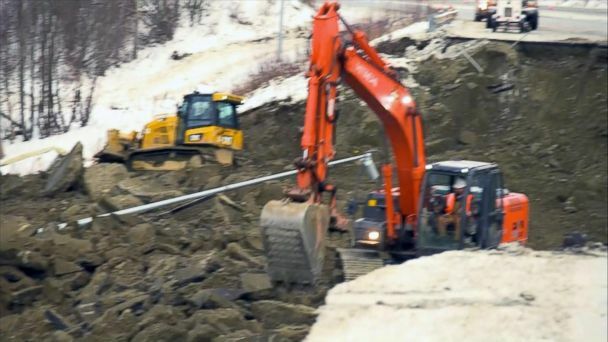 Footage shows the destruction of an exit ramp in Anchorage. Ceiling panels, cameras and TVs are all seen on the ground of the KTVA studio. For hours, the city's airport was shut down, with air traffic controllers waving off incoming planes before finally evacuating their tower. Gov. Bill Walker said he spoke with President Trump 4 times today to discuss the damage from the earthquake. New images show the moment the 7.5-magnitude earthquake struck in Indonesia, killing at least 1,400 people. Startling before and after satellite images show the impact of the devastating Indonesia earthquake and ensuing tsunami that killed at least 1,234 people. The death toll was rising after the double tragedy struck the country. 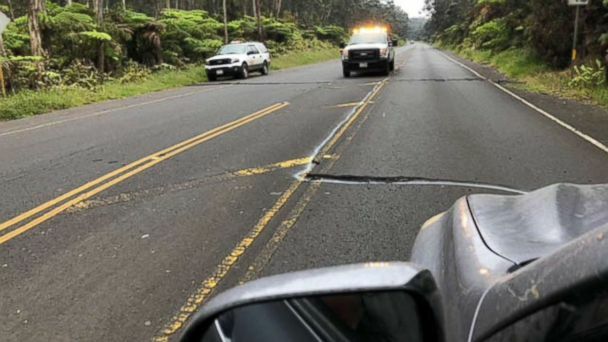 There were no reports of injury or damage but officials say the quake was the biggest to hit the region in three years. The island of Lombok is popular with tourists and now about 1,000 foreign visitors have been evacuated to nearby islands. The 7.0-magnitude earthquake that hit the Indonesian island of Lombok also left more than 20,000 people homeless. A magnitude 7.0 earthquake rocked Indonesia's popular tourist island of Lombok on Sunday, according to the United States Geological Survey. A 6.1-magnitude earthquake struck the city of Osaka and its surrounding areas, killing at least three people. 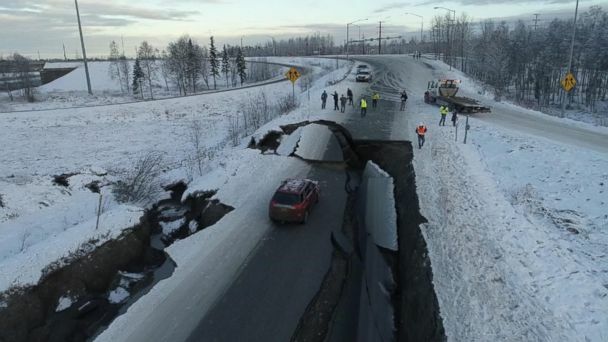 “It’s potentially catastrophic,” said one seismologist. The quake was the largest in a string of 70 reported earthquakes in the last two days. At least four people are dead and more than 240 have been injured. Officials asked residents on the California, Oregon and Washington coasts to steer clear of beaches today. 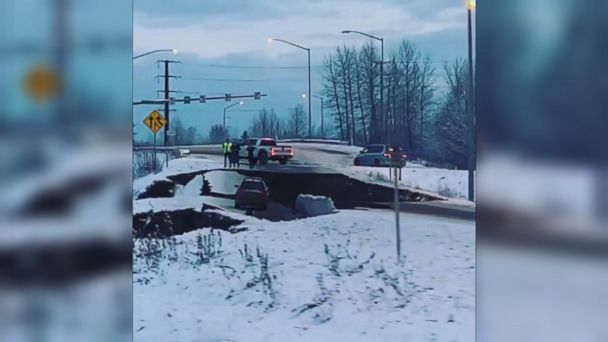 ABC News chief meteorologist Ginger Zee tracks the latest weather conditions in Alaska where a 7.9 magnitude earthquake triggered tsunami warnings. The earthquake was measured at 7.9 on Tuesday morning. CDC is investigating an E. coli outbreak that sickened at least 58 people in 13 states and Canada. The earthquake was centered in the Delaware Bay. The 4.1 magnitude quake was centered near Delaware and was felt in Philadelphia, D.C. and New Jersey. A magnitude 5.4 earthquake shook southeastern South Korea today, the largest quake to hit the nation since last year’s trembler in nearby Gyeongju. 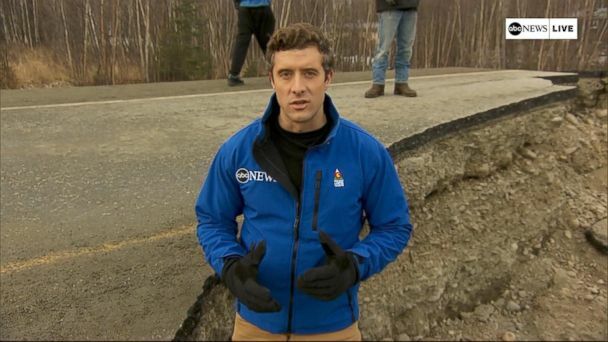 ABC's Molly Hunter has the latest on the massive quake that shook the Iran-Iraq border. Frida, a 7-year-old Lab, has helped pulled more than 50 people to safety after Mexico City's earthquake. The earthquake rocked central Mexico on the 32nd anniversary of the biggest quake to strike the country's capital. Mexico's president called it the biggest quake Mexico has seen in a century. Mexico's president called it the biggest quake Mexico had seen in a century. A strong earthquake in the Aegean Sea overnight leveled buildings and injured hundreds of people in Greece and Turkey.